On June 14 1940 Hans and Margret Rey fled Paris as the German army invaded the city. Escaping on bicycles they took only winter coats and four picture books strapped to the racks. Among those books were the watercolors and a rough text for Fifi later known to the world as Curious George. However when Curious George was actually published in the United States in 1941 these original watercolors were not used for the printing. Hans Rey was required by his editor to redraw the entire book creating preseparated art so that costs would be minimal. The Reys retained the original art and would on rare occasion treat carefully chosen friends and collectors to George as he was first envisioned in Paris those many years ago. During their lifetimes they parted with only five pieces of the extraordinary art. 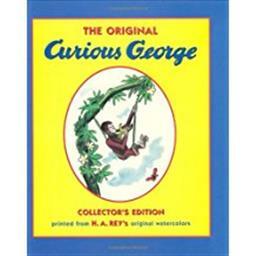 For this edition the original Curious George drawings have been retrieved and reassembled using modern reproductive techniques.